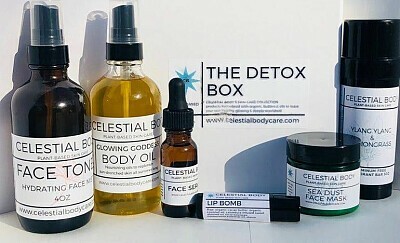 he CELESTIAL DETOX BOX includes organic, butters and oils, created with nature, to provide ingredients that your skin can recognize and use to its optimal benefit. Leaves your skin feeling luminous, fresh and hydrated This is a box filled with one of each of our Celestial Body Care products. Comes in a cable box and wrapped in tissue paper.A gift that is ready to go and perfect for any occasion. Includes: CB BODY OIL- a super blend of hydrating and nourishing oils that will penetrate and leave your skin supple and so soft. Contains organic calendula-infused raw, cold-pressed sunflower oil, pomegranate oil, kukui nut, helio carrot seed oil, rose geranium essential oils SOLD SEPARATELY: $35 CB DEODORANT CREME BAR 3oz of all-natural, aluminum-free deodorant that really works. It will also heal and soothe the underarm area after years of using chemicals. A blend of active ingredients such as kaolin clay and arrowroot absorb odors and allow skin to breathe and sweat, but gently clobbers at the same time. CB LUNA BLU FACE SERUM-this dynamic blend of macadamia nut, rosehip seed and skin-friendly essential oils will have your face glowing like it’s meant to! Just apply after our CB SKIN DUST MASK and you will be on your way to beautiful, simple clean skin! CB SKIN DUST MASK-a blend of kaolin and bentonite clay, spirulina and skin-friendly essential oils to tighten pores, pull toxins and deep clean with all-natural organic ingredients. CB SKIN MIST TONER-a refreshing spritzer to be used after our SKIN DUST MASK, and before the CB LUNA BLU FACE SERUM, or anytime during the day. I created this at the pool, to just mist my face with carrot seed oil (natural spf) and aloe vera to tone, soften and refresh! CB LIP BOMB-we don’t call it the BOMB for nothing! We’ve perfected the bomb to the best texture and consistency. Adds moisture with raw, organic cacao butter, sweet almond oil and locally sourced beeswax. Little shine, tops it off!